Last night President Obama backed down on his threat to take some unspecified, but “unbelievably small, limited” military action against Syrian dictator Bashar al Assad in favor of reluctantly following the Constitution and the demands of the American public that he abandon the idea of another American war of choice in the Middle East. In what was one of the more astonishing presidential addresses in American history, Obama looked to Russian President Vladimir Putin to save face after his foolish statements about “red lines” on chemical weapons use and feckless threats to teach the Syrian dictator a lesson about international standards of conduct through “unbelievably small, limited” military strikes. At the conclusion of Obama’s speech on Syria neo cons and anti-Obama partisans couldn’t wait to declare that Putin and the Russians won – but they were wrong. Putin and the Russians didn’t “win,” the millions of conservative and libertarian-minded Americans who rallied together to oppose another establishment elite adventure in the Middle East won. Senator Paul went on to remind us that James Madison wrote that the "Constitution supposes, what history demonstrates, that the executive is the branch most prone to war. Therefore the Constitution, with studied care, vested the power to declare war in the legislature." Senator Paul was right, but for the Constitution to work the citizenry and the legislative branch must be willing to demand that it be followed – and be prepared to confront the President if it isn’t. 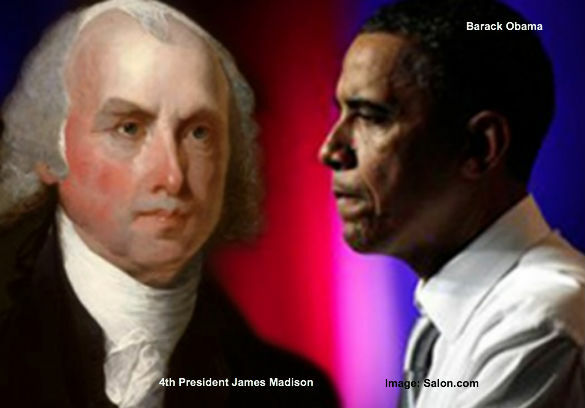 President Obama, the neo con Republican establishment and the rest of the pro-war faction in Washington will never admit it, but last night in exactly the kind of constitutional confrontation Madison envisioned they lost, and lost big time. Madison’s wisdom was vindicated, and America’s grassroots conservative and libertarian-minded citizens won, because they rose-up and demanded that their President follow the Constitution and their legislators listened and were prepared to vote “NO” on another American war of choice in the Middle East. Submitted by morleron on Wed, 09/18/2013 - 15:16. Yes, we (the American people) have won this in the short run. However, President Obama has not ruled out the option of exercising what he sees as his "executive powers" to unilaterally order an attack of some sort on Syria. In spite of his posturing about talking with the Russians about making a deal to place Syria's WMD under international control, prior to destroying them, there has been no reduction in the American naval presence in the eastern Mediterranean or the Arabian Gulf. Should whatever "talks" emerge fail we will see a renewed drumbeat for attacks on Syria in order to maintain our "credibility." We must not let our guard down on this issue and need to continue to inform the American people about the falsehoods circulated by the Obama regime and the multitude of unfavorable outcomes likely should any attack on Syria go ahead. Submitted by thequadfather on Sat, 09/14/2013 - 12:14. I have never seen the country so united as we were on this issue. Obama had already lost. He just didn't know it yet. All Putin did was give Obama a way to escape while saving face. His only ally, the French.